Good morning, Ryan! Wake up – today is a Very Special day. What's Special about today, Daddy? It's your Birthday! Happy Birthday, Ryan! Oh, Daddy! Oh, Mommy! I'm Surprised! Yummy! 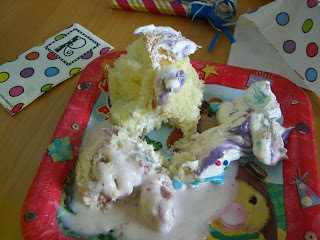 I never get Cupcakes and Ice Cream for Breakfast. Everything is Delicious! –And my plate has a Duckie on it! Oh, thank you for this Surprise! Oh! Thank you Mommy and Daddy. It's a Radio! Is it a 'real' Radio, Daddy? It is your very own Radio, Ryan. Now you and Dog can listen to soft music in your bed before you fall asleep. A really big Book! Mommy can read it with me! Look! Someone made a mess here. It's a story about a Mouse, Ryan. It is a Mouse that gets loose in a House. On every page of the book you have to Find the Mouse. but only one Real Mouse! Look, Mommy! Look, Daddy! I caught the Mouse! Ryan, we can read the book later. There are Games to play. I can do this, Daddy. It's easy. You have to put on this mask, Ryan. No peeking! Daddy, this is Hard. I cant't see. Did I do it o.k.? Try again, Ryan. A little more to the right. Happy Birthday to you, Ryan. Happy Birthday to you. Happy Birthday Ryan! Today was my grandma's birthday too! 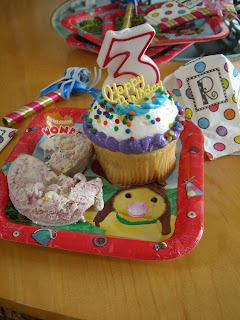 Thank you Marlowe, Neoguest and Buttons, for your birthday greetings! 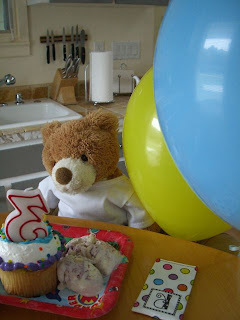 I had a nice birthday with surprising gifts... especially my new bear-sized table top radio!